The Wellington Bridge Club has over 400 members. Members meet at the clubroom up to 4 times a week to play, plus on weekends when there are tournaments held. At any one playing session, we have between 60 and 120 participants with over 20,000 player-events per year. There are a number of ways that organisations can get their brand or message to our members. Please contact us if interested. Events – All event sponsors have their name and logo alongside all our published mentions of the event (i.e. programme book, posters, email, website, etc.). Every formal mention of the event at the club by the director or grade captain includes the sponsor’s name. Major tournament sponsors can be offered the opportunity to have promotional material available at the event e.g. flyers or posters. Programme book – Each member has a copy ot the programme book, and refers to it several times a week to maintain their playing schedule. It is published annually in late October. Page half-hage and quarter page segments are available. Website – Our website is referenced frequently by members. 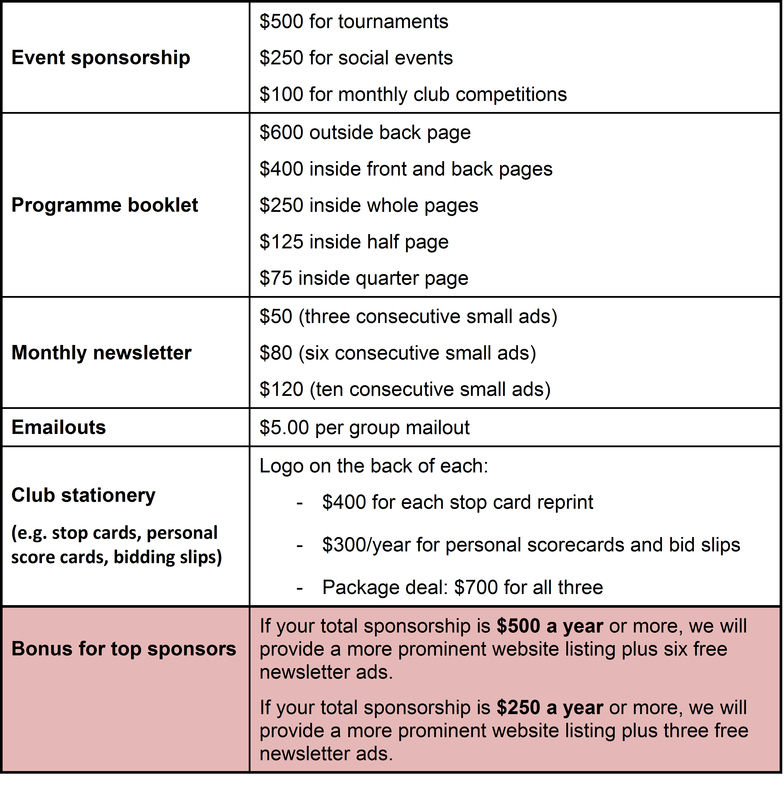 There is a sponsor page, and tournament sponsors get special mention on our Home page at the time of the tournament. Page view statistics for the website are available on request. Monthly newsletter – The newsletter is published monthly and copied to all members. Current and previous newsletters are saved on our website. Emailouts – From time to time, we email groups of our members to notify them of events thay may have specific interest for a particular group. Gruop mailouts are usually in the vicinity of 50 members. Club stationery – The club has a number of stationery items that are highly suitable for a logo or message and which are set out on the each playing table each session (e.g., bidding slips, personal score cards, "stop" cards).